One of my favourite things about Rome is that while it’s full of fascinating old buildings, the majority of them aren’t considered a big deal. They’re just regular churches, apartments, shops that people use every day – which means even without paying for a ticket, you can see some amazing architecture and hidden Roman spaces. This is one of the reasons I love the Chiostro del Bramante, just round the corner from Piazza Navona. The space is most well-known as an art gallery, with different exhibitions on every couple of months. For those you need to buy a ticket, and at the weekends there’s often long queues to get one – but what most people don’t realise is that you can actually enter and explore the building free of charge. 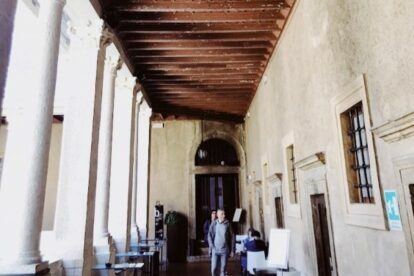 Just bypass the line and you’re in a cloister designed by Donato Bramante during the Renaissance. The courtyard is beautiful, and if you go up stairs to the side you can view the whole thing from a balcony that goes right the way around it. There’s even a coffee shop with free wifi, so you can perch on one of the marble seats surrounded the balcony and check your emails, or do a bit of work! A hidden place to get a bit of peace in the centre of Rome.